… and rubbed my eyes in disbelief. In pearl, and grey, and white and black. For other wonderful peeks, please visit: My World! 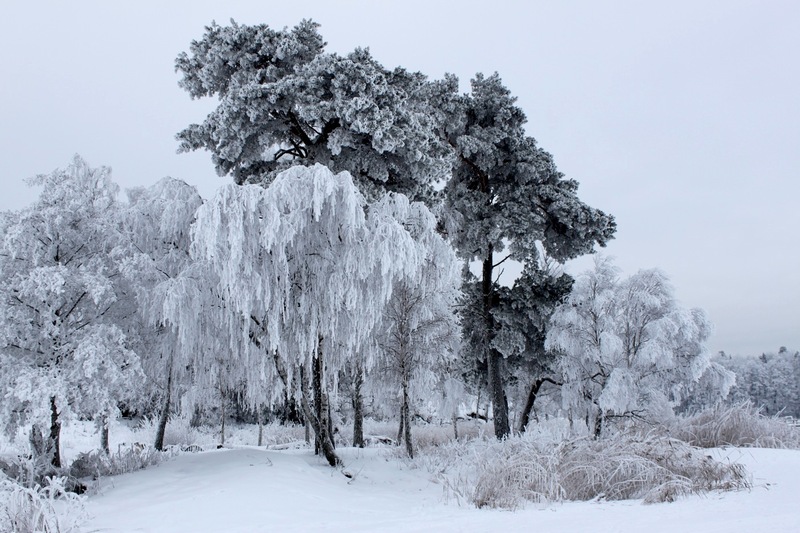 Posted in My World, NatureTagged hoar frost, photography, Sweden, trees, winter, yes - it was cold!Bookmark the permalink. Oh, how gorgeous! This one really took my breath away! I’m so glad you captured it and thank you so much for sharing! That is one of the most beautiful, snowy pictures I’ve ever seen! It’s worth being cold! Have a beautiful week, my friend! It IS like a painting. I too started to say it is like a painting, but I think any painter would be incredibly lucky to capture this! There isn’t much that makes me think freezing would be worth it, but this could do it. It really is beautiful Fi. Who but nature could paint such a wonder? Spectacular. What a fantastic picture, and I loved the text accompanying it. You are a poet, Fi, not just a photographer. glorious! this scene is like a dream. Wow, wonderful photo – quite stunning. But it’s not Oscar – he’s below. I swear that dog has intelligence in his eyes. I don’t really know what to say….it’s breathtaking!! How astoundingly gorgeous! And you’re just wonderful to be quick with the camera and share it with us. Thanks. I think this takes the prize for my favourite snow picture ever. It is simply gorgeous, Fi. Your photos this winter have sparked in me a desire to move to Sweden, or at least spend a year there! LadyFi: What a super capture of the winter wonderland outside your door. BRAVO Lady Fi- absolutely gorgeous photo!!! So pretty! But so chilly! I’m about ready for lush greenery and a heat wave these days! Stunning! We had frosted trees this morning too, but not as dramatic as these, stay warm! Wow! That’s quite an image. I had a similar image about two weeks ago. But it is gone now. I think it is somehow spooky. Such opalescent beauty – and right outside your door. Lucky You! Fi, that new camera is really paying off. What a gorgeous capture. I can only wish we had such sights, well on second thought, I am quite happy to only see them on blogs. thanks for sharing this , it’s breathtaking. awesome! Nice to be back again. I love your blog! And congrats on POTW mention. It’s a beautiful photo and you must be enjoying your new camera! It’s hard to imagine anything more beautiful than the unexpected things nature paints for us. Magnificent. Congratulations on your Post Of The Week recognition at Hilary’s. Wondrous is an understatement for sure!! Awesome photo!! Congrats on your post of the week!! That is just the most amazing photo! beautiful….what a pleasant surprise as well. smiles. oh that is indeed a breathtaking shot! Dear Lord, what a shot! Very Ansel Adams. And color film, you say? Amazing. Congratulations on the potw mention. This photo might have just convinced me that snow IS beautiful!! Stunning! That’s the part of winter that is so special…Mother Nature making up for the cold. Congratulations on your POTW status! Congrats on this one being named one of Hilary’s POTW!!! Looks divine and as a Norwegian I feel like home in this; nice, quiet with crisp, fresh air – lovely! Btw: Thanks for you’re visit and nice comment on my Oslo Ice Bar post. I would love to go to the Ice Hotel in Jukkasjärvi one day! Guess it’s kind of like Kirkenes Snow Hotel. How stunning! A wonderful view of the power of nature. It is stunning but I couldn’t figure out if the ice had formed the illusion of leaves, or whether the tree already had evergreen leaves with frost settling on them. It’s thick hoar frost on the evergreen needles! We live in such lucky times, don’t we? We can capture beautiful scenes with such clarity and keep them with us. If you ever need a shot of perfect beauty? You’ve got it, and now you’ve made sure we all do too. How lovely. Congratulations on the post of the week mention at Hilary’s blog! My jaw dropped when this photo fully loaded. Amazing. Congrats on being names in the Post of the Week! INCREDIBLE, this is ART at its best. I would lvoe to see this picture blown up. Congratulations!!! This is really beautiful! Glad you were up and out to capture it. What a magical mystical view … like something out of CS Lewis (ie the Lion, the Witch, and the Wardrobe) … simply beautiful (and certainly illustrates why you were delighted by the brief stretch of sunshine and blues skies shared for Sky Watch! Absolutely astounding! Your photo takes my breath away! This is a masterpiece. It is a reminder to see and take wonder in the differences in life that truly stimulate the senses no matter how big or small the changes are. Feeling the Moment allows us to move forward freely into the next moment. There are no words! So beautiful!